Each year brings new technologies and trends that change the way general contractors and construction businesses market their services online, and 2016 is no exception. Internet marketing techniques and best practices for designing and promoting websites are constantly evolving. Here are our top marketing tips for maximizing your site’s potential and implementing new strategies while avoiding common mistakes. 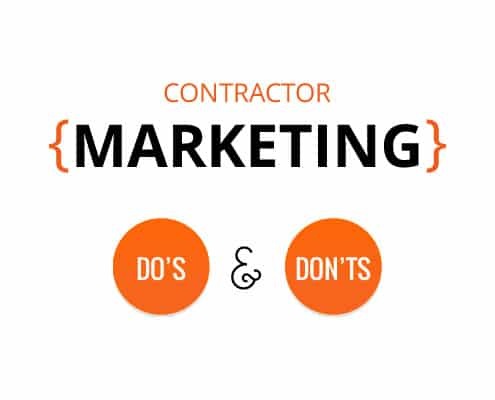 Here is our list of Do’s and Don’ts that can help you achieve better results with your contractor marketing in 2016. Original content propels successful websites. It can boost your ranking with the three biggest search engines and others. If you provide the information that customers want, your web pages and blog posts will get more traffic. This will increase your site’s ranking, which will draw in even more visitors and leads. It’s a cycle that you won’t want to break. The secret to content marketing is providing up-to-date, relevant information that’s updated regularly. Maintaining a website, a blog and a social media account takes ongoing work. You don’t quit in the middle of a job, and neither do we. Effective content will maximize your site’s potential. As a contractor, you don’t build cookie-cutter houses, and don’t want a cookie-cutter website with generic text. You might not think so, but we have a few things in common with our clients. Customization is the focus of our business and yours. It’s all about understanding the client’s vision. We don’t help clients pick cabinets and counters, but we can help you create original content that represents your business and engages your audience. Duplicate content that’s copied from your own site, from competitors or from industry groups can curse your Google ranking. It can trigger copyright complaints requesting that you take down the copied text. In the best case, the problem might be time consuming and embarrassing. In the worst case, it can lead to costly legal problems. Copying isn’t just about your blog posts and web pages. It’s about style choices, technical features, page layouts and the overall design. The look and feel of your website should be your own, not someone else’s. It doesn’t matter if you run your business out of your garage or out of multiple offices in the region, your website gives your brand an identity. As professionals who are dedicated to marketing contractors in the construction trade, it’s our job to make your website and social media pages stand above the competition. Original web content and a customized design will set you apart from that roofing company across town. On the other hand, a competitor’s website can give you a better idea of what you do or don’t want to include in your design. Search engine optimization (SEO) is a constant in the rapidly changing web technology field, but the methods used for ranking sites are always evolving. Today, Google’s algorithm considers more than 200 factors when determining a website’s ranking. In fields like custom home building, general contracting and commercial construction, your website needs to rank well for specific keywords, but it also has to be visible in the local markets that you serve. With the number of competing websites in the nation and in your service area, SEO is more important than ever. It’s also more confusing. Original, informative and relevant content is increasingly important. Content creation includes a number of additional SEO topics. While no one knows Google’s exact formula, it’s certain that keywords are important. Titles and subheadings contribute to a page’s ranking, and the right links can increase a site’s authority. Page rank is influenced by a variety of on- and off-page factors. In essence, SEO consists of many different parts working together. When it comes to SEO, the things that worked yesterday aren’t always helpful or effective today. In fact, some outdated techniques can hurt your site’s ranking. Keyword stuffing is one example of a strategy that was used extensively in the past. To combat ruthless companies that were tricking search engines, a high density of keywords is now a red flag that can drastically lower your placement in search results. Google provides some tips for creating websites that work with search engines, but in most cases, the guides are not enough to create a well-rounded strategy. Business owners who’ve read up on SEO techniques in the past might hurt their site’s ranking by implementing these strategies today. Optimization goes far beyond keyword selection and placement. 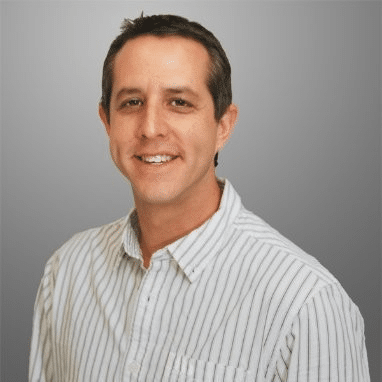 In addition to following fundamental practices like those included in Google’s webmaster guidelines, your SEO provider should have experience in your industry and a proven track record of achieving positive results. When you’re hiring a professional, do you look at online reviews first? Do these statements impact your buying decision? An overwhelming number of consumers say yes. The need to research products and services powers a number of global business directories that provide company information and customer feedback. Studies show that 60 percent of consumers look at reviews before making a purchase. Most people say that online comments impact their decision on whether or not to use a company. Consumers trust online reviews and form opinions after reading just a few testimonials. Facebook, Yelp and Angie’s List are a few of the largest business directories and review platforms that are suitable for contractors. As of March 2016, Yelp is home to 102 million reviews, and 12 percent of these rank home and local service providers. Online directories can give your business a strong reputation that sells your services. Links to and from directories can also improve your SEO and site ranking. Listings in business directories can boost your site’s authority and customer traffic, but this does not mean that you should go out and register for every site that you can find. Not all directories are good or worth considering. The power of SEO and customer reviews doesn’t always work in your favor. A long list of directories has been blacklisted for violating Google’s guidelines. An association with low-quality sites that condone paid link exchanges and deceptive SEO practices can assassinate your website’s credibility. It doesn’t matter if these sites are free. They can still hurt your ranking. Stay away from sites that look spammy or don’t monitor reviews. Find quality directories that focus on contractors instead of every other business. Houzz is one site that’s excellent for builders and residential contractors. Credible directories stay in business longer and can improve your site’s authority. The Better Business Bureau and your local chamber of commerce also have credible directories. The best web content isn’t just helpful and informative. It’s interactive. Content that engages an audience is increasingly important. Some of the most popular sites and frequently visited pages provide these resources. Although people love quizzes, surveys that assess a customer’s personality clearly aren’t appropriate for contractors. No one wants to determine which type of roofing material is best for their astrological sign. On the other hand, you can showcase your work through interactive features. Photos taken before and after remodeling jobs work well for contractors. You can also publish slideshows documenting past projects, posts showing the progress of builds and videos providing information and helpful tips. Interactive content fares well on social media platforms and websites. Visitors remain on pages longer if they have videos to watch. This gives you a greater chance of making a sale. Interactive content is more likely to be shared. Visitors might post your awesome kitchen remodel on Pinterest or send a link to a friend who needs a contractor. Interactive content has more power than a Sawzall. It gets tough jobs done. Content defines your online presence. Online business directories have long since replaced phone books. Websites and social media platforms are the new word of mouth. However, these tools don’t work without a plan, a schedule and a strategy. It takes experience and know-how to manage social media accounts and to get the best return. Effective strategies must involve your website and social media accounts to grow your customer base and increase your local marketing capabilities. Facebook, blogs, LinkedIn, Twitter and YouTube are five of the most important Internet marketing tools. Engaging an audience of potential customers over a social media platform lets you increase traffic to your website and build a stronger email marketing list. Your social media plan should include fresh articles and blogs. Once they are posted on your website, you can publish a short summary on social media accounts and link back to your site. Repeat this every week if you can or at least twice per month. People who follow your accounts on social media want quality content and helpful information that’s posted regularly. 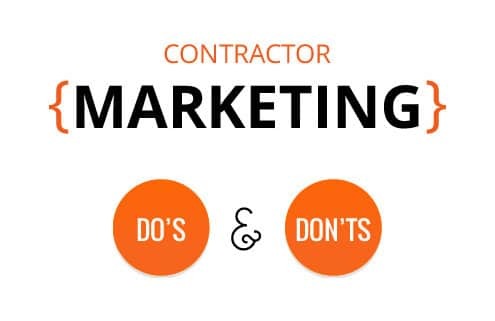 We hope that these marketing tips help your construction business grow throughout 2016. What are you doing to improve your website’s ranking this year? Let us know by leaving a comment. We look forward to reading about your experiences and answering any questions that you may have. Set Realistic Expectations for Effective SEO Is Your Construction Website Giving Customers What They Want?